If you’ve been craving simple, plant-based meals that don’t require a ton of time in the kitchen (like me), this is the recipe for you! 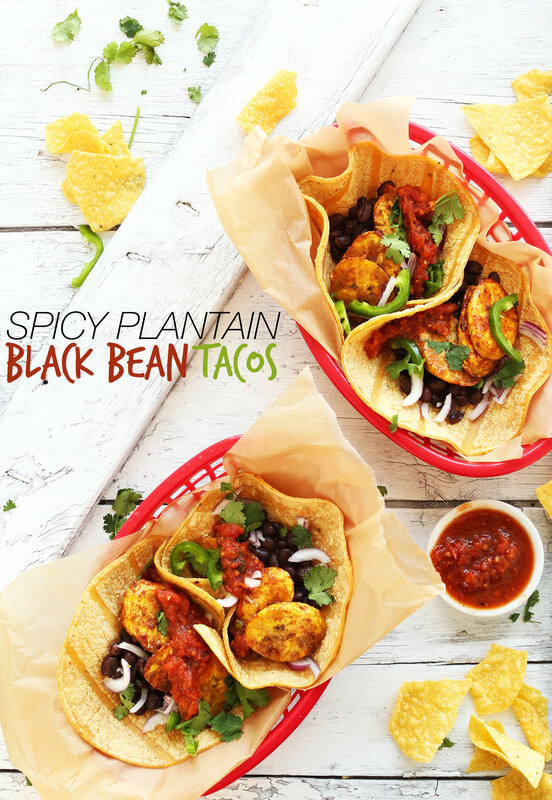 My love affair with plantains continues with these 20-minute Spicy Plantain Black Bean Tacos! This recipe is quick and easy, requiring just 20 minutes and 10 ingredients. And with all of this summer heat, you’ll love that there’s little heat required. It begins with spicy-sweet plantains sautéed to caramelized perfection. In the meantime, black beans simmer away while you prepare your desired toppings. I found jalapeño, onion, and cilantro to be the perfect texture and flavor additions. And of course, who can forget the sauce? Salsa and hot sauce go great here. These would make a great weeknight meal when you want something quick, flavorful and hearty. You could even sub large tortilla shells and make this into a burrito, or put everything atop salad greens for a more vegetable-heavy dish. If you try these tacos, let us know how it goes! Leave a comment, rate it, and take a picture and tag it #minimalistbaker on Instagram (our favorite) so we can see. Cheers, friends! 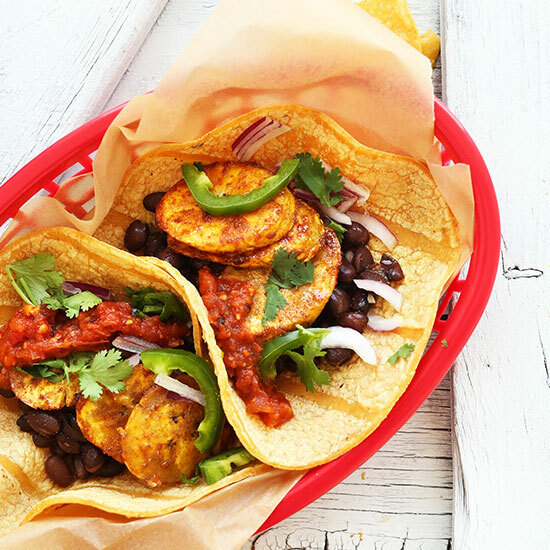 Simple, flavorful, 20-minute tacos with spicy-sweet sautéed plantains and smoky black beans. A satisfying and quick plant-based meal! Add black beans to a small saucepan over medium heat and add spices. Once it reaches a low boil, turn heat to low to keep warm, stirring occasionally. Peel and chop plantains and heat a large metal or cast iron skillet over medium heat. 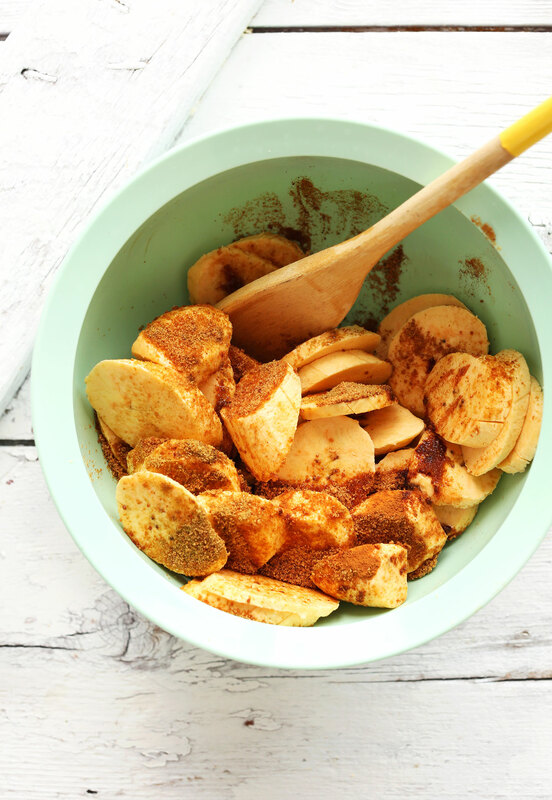 Add plantains to a mixing bowl and toss with spices. Once pan is hot, add coconut oil and plantains and spread into a single layer. Sauté on one side for 2-3 minutes, then flip and sauté on the other side for 2-3 minutes more. Turn down heat if browning too quickly. You're going for a caramelized effect. Set aside. In the meantime, prep desired toppings and warm tortillas by wrapping in a damp cloth or paper towel and warming in the microwave for 20 seconds (or place tortillas directly on an oven rack for 1-2 minutes in a 350-degree F (176 C) oven). To assemble, top tortillas with black beans, plantains and desired toppings. I preferred salsa, hot sauce, red onion, cilantro and jalapeño. Ripe avocado would also make a great addition. Best when fresh. Serves 3-4 generously (as original recipe is written). *Make sure your plantains are deep yellow with brown spots and tender to the touch. Otherwise, their flavor won't be as developed and they can be chewy in texture. This recipe is perfect, no need for modification other than a little extra heat for preference. This recipe is a staple in my house and I’ve been making it for a year! Love it! These are absolutely delicious tacos. My husband and I recently changed our diets to a plant based diet and these definitely fit the bill. They are sweet, spicy and savory. They are also very filling. We have these at least once a week. Thanks so much for the recipe. This is also my favorite way to prepare plantains. Even when I’m not making these tacos, I’ll season my plantains with this blend. So perfect. I made this recipe multiple times! Plantains are a staple in my kitchen.I grew up eating plantains so this was a definite for me! Great combination of spices that bring put the sweetness of the ripe plantains.Thank you! These were the best tacos I’ve ever had. I added a little more cayenne and then made your Green Chutney and used it as a topper, along with Sriracha. So delish! I made these last night and all I can think about today is making them again! I used all of the recommended condiments + guac. and it was a party in my mouth. The mix of spicy & sweet was just beyond amazing. Dana, I made these for my family (including my brother-in-law’s family who are visiting from Algeria) and they were crazy about them. The flavors are just exquisite! You helping to give vegan cuisine a GREAT name. THANK YOU!!! I’ve made this 3 times this week. It was SO easy, tasty and filling. Husband ate more of it than I did. I topped with cilantro, red onion, avocado and a little queso fresco. So so so good and honestly one of the easiest dinner to throw together. These were amazing! I didn’t have any of the yummy toppings to put on top but they were still absolutely fantastic! I topped it off with some cooling watermelon for dessert and frankly I’m so full I don’t know if I’ll ever eat again! In one comment you say to use the liquid from the can to boil the beans, and in another comment you say you drain them. Do you use the liquid from the can to boil them, and then drain them once they’re hot? Ridiculously good. Healthy and fast plant-based recipe…a true winner! Going on the rotation. ? These were amazing!– my husband and I are new to the vegan diet and these were amazing! Thank you for sharing! These were really, really delicious and a very simple weeknight recipe. Thank you for that. I simplified the method a bit by just stirring the black beans in at the end to warm and adding the extra cumin from the black bean mixture into the plantains and it worked out perfectly. Next time I might add a bit less sugar (my plantains were so sweet as to not need much caramelization) and a bit more heat (I used chipotle chili powder in place of the cayenne. These were so lovely. Thank you for the recipe. As usual with Minimalist Baker, an absolutely amazing recipe. My boyfriend and I can’t get enough, I’ve been making them at least once a week for over a month. Add some Tofutti Better Than Sour Cream to the suggested toppings and take it to the next level! Second time making these. I love them!! So summery and bursting with flavour, not to mention easy to make. I’m learning to cook using your recipes and this was my first one. Absolutely delicious! I am now officially obsessed with plantains. I can’t wait to try more of your recipes! Thank you! I have made these dozens of times by now… and they never fail to hit the spot!!! I was thrown at first by the sweet smell when I was mixing everything together, but these are just perfect every.single.time. This was so good that I almost couldn’t stand it! Thank you and five stars for you! Holy guacamole! This was SO good. We sauteed some broccoli and mixed with homemade black beans (only takes 1 hr. 45 mins. on stove with cover and salt). Some homemade pico de gallo on top. Our plantains were yellow (not green) but not ripe…was delish. Fantastico! Thanks! Delicious recipe. The plantain, beans, and lime are a great combination. I’m meal planning for four adults with very different likes and my whole family loved this. It’s a 5 star recipe in our book. My husband loves meat, I changed to clean raw food 10 months ago, my dad will eat anything I serve him, and my son just told me a month ago he was now a vegan so I was searching for vegan recipes and landed on your site. I see lots of great recipes I can’t wait to try. This was a first encounter with plantains for me and my husband. Outstanding! Tacos will never be the same. Served this on The Pancake Princess’s “chickpea tortillas.” So good all around. Thank you! I am so excited I can’t wait to try this!! If you’re ever in need of more food-spiration, you can be my hero and make a delicious homemade version of El Rey’s mango pie. Just sayin’. Mango Pie? Tell me more! 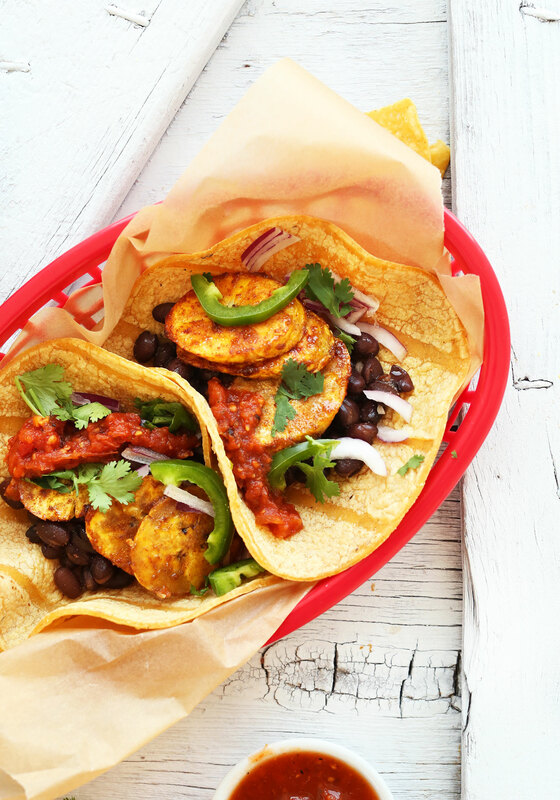 I have just tried these tacos and enjoyed the combination of flavors in platain and beans) I have been looking for decent vegan tacos for a while and here they are) thank you for the recipe! I REALLY need to find some plantains somehow! These were super yummy! Makes me want to eat more plantains. Thanks for the recipe! I loved these. Spices are a great combo and plantains are almost buttery tasting. Wouldn’t change a thing. The salsa I used is HEB medium salsa (fresh from produce section). Will definitely make these often. We made these babies last night and boy oh boy were they ever good! My boyfriend raved about them and I think he will be requesting this as a weekly meal from now on! What a great treat / something different for a meat free Monday :) Keep the hits comin’ girl! So wonderful! Thanks for sharing, Samantha! As someone who is from Dominican Republic and OBSESSED with plantains, I was SO excited when I saw this recipe! Plantains and black beans are two of my favorite foods and tacos are my other! Can’t believe I’ve never thought of putting plantains into tacos. Will definitely be making this recipe this week! I just made these and they were bomb! the raw onion and jalapeño are key. thanks dana! I made this for dinner tonight. It was amazing! I have never successfully made plantains before , but the smell brought everyone to the table . Delicious, thanks for sharing. Wonderful! Thanks for sharing, Sandra! I made them and the plantains came out amazing!!! however, can you clarify what you mean in re: to bringing the can of black beans to a boil. Was I supposed to leave the water from the can in them? I drained them, before putting in the pot so was unclear how beans could boil? This recipe looks good. I am accustomed to rinsing canned black beans when using them in a recipe. Sounds like that is not done here, correct? Thanks. These were amazing!! They only took about 15 minutes total, and you can’t beat that for a homemade plant based dinner. I’ve made so many recipes from your site but this is definitely in my top 5 favorites!! I meant JACK cheese, not back cheese. Thanks, autocorrect! I made these tonight and we were too busy scarfing them down to take photos! I made the black beans from scratch, and we sautéed some red onion and bell pepper. Also added some back cheese, sour cream and guacamole. We are going to try to reheat the leftovers for dinner tomorrow and see how that works. Delicious! My kids loved them, too. Once my green plantain ripens, I’ll try it with avocado in it, too. Are we supposed to add water to the beans so that they can boil? p.s. love the cinnamon in the tacos! My canned beans usually have liquid in them. If yours don’t, add a little. Ah I see, so we shan’t drain the beans I presume? Just made these! I don’t normally comment on blogs but they came out so wonderful. I have made plantains many times but I’ve never put any spices on them- they’re delicious. The flavors are all perfect together. Thanks! Great to hear! Thanks for sharing, Alex! Agreed! If I walked into Chipotle and these were on the line up, I might faint. These look so good and my husband loves plantains! As I list in the recipe, yellow with brown spots. Wow! These are making my mouth water! Plantains are one of those foods that I love but seldom cook with. I need to change that asap so I can make these beauties! Holy smokes this just looks amazing, sounds amazing, all amazing. I can only imagine what it would taste like in my mouth right now ! I will for sure be giving this a try asap! Thanks for the recipe ! I tried these tacos today. They turned out to be delicious. I cooked my black beans in oressure cooker and I made my own corn tortillas. I used peach salsa and hot sause for optional ingredients. They tasted wonderful, I especially liked the spices on the plantains. Who needs meet to make delisious tacos. Yay! Thanks for sharing, Valentina! I hardly ever cook with plantains, but this sounds yummy! Tried plantains for the first time since moving to the northern hemisphere and fell in love (granted, they were deep fried and served with cerviche) but spicy and tacos too? sold. Hey Dana! I was just listening to your episode on the One Part Podcast, and I loved getting to know you a little better and listening to all your mega-tips. You are John are tops and so great at what you do. And, I’m realllly lovin’ these tacos. Keep fighting the good fight, xo. 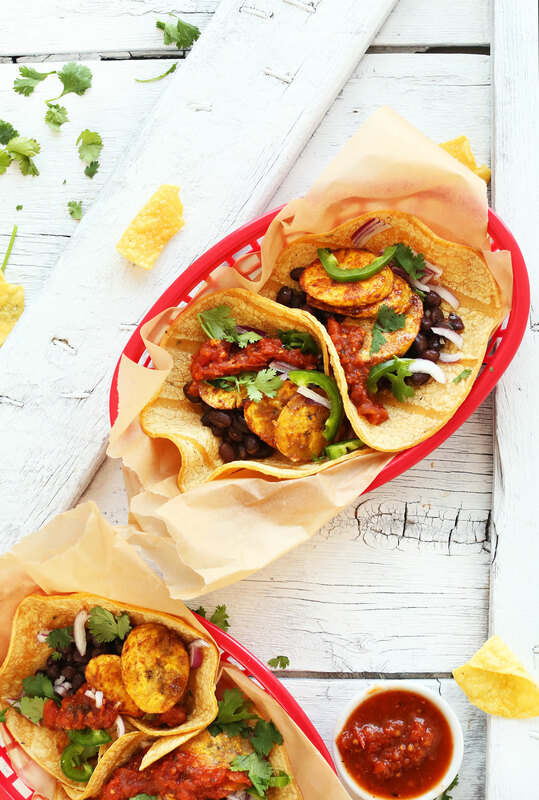 These tacos look gorgeous- I’ve never cooked with plantains before but now I’m desperate to try it! Ooh, you must! You’ll fall in love! I love plantains, but I’m not good at coming up with new ways to prepare them. These look fabulous! Now I’m craving tacos…. So great! Glad you both enjoy them so much. Hope you love these tacos as well! Hi Dana, just wanted to say that I love your site and have made several of your recipes. I check your page everyday for inspiration. Everything you make looks absolutely amazing. The tortillas you use always look so good, what brand do you buy if you don’t mind my asking. Thanks for all the great healthy ideas!!! So kind! Glad you’re liking what you see! That brand is from Whole Foods, but usually any yellow corn tortilla works great! Is it the 365 brand? I would slso appreciate the info! Helps a lot since I’m just starting vegan cooking for my family and don’t have time to sort through all the different brands. I saw some in the “dairy” section where they have shredded cheese – is this where you find your tortillas Dana? I highly recommend trying to get fresh tortillas from somewhere locally! Otherwise, Mission tortillas are best. I’ve not tried Plantains in tacos, but you’ve convinced me this needs to change, Dana! Thank you for this!! You had me at Spicy! Yay! Hope you give them a try, Traci! This recipe looks delicious. I haven’t used coconut sugar. Is there a reason why you use it in this recipe instead of other options? These look GREAT! I never thought of putting plantains into tacos! Yum!! I cannot wait to try adding plantains to my tacos. That’s an awesome idea! I absolutely need these in my life. Plantains in tacos?!?! AH!!! I feel like you’ve started the plantain parade! I see them everywhere now! This looks heavenly. I can’t wait to give it a try! I blame it on the Whole Foods hot food bar. Their caramelized plantains are INSANE. Can’t get enough of them now! These sound great! I first had plantains in Puerto Rico and am always looking for ways to use them. Plus tacos, I mean is there anything better? Love your blog and your amazing simple to make recipes. When I saw this my eyes completely bulged out of my head, cartoon style. Lol I really love plantains too so will definitely be checking this out! That’s a pretty good reaction if you ask me. Thanks Trudy! Hope you love these! Yum! I love tacos of any kind, so thanks for sharing this variation!